English food is not a joke. Most of the time it can even make you forget about the appalling English weather. Judging from all of the recipes I've been posting lately, from British cookbooks by Jamie Oliver, Nigella Lawson, Nigel Slater, Rose Gray and Ruth Rodgers, I've developed a bad case of anglophilia this spring. It's been fueled mostly by the UK site, Eat the Seasons, and their inspiring cookbook companions, which have helped me take a whole new look at how to choose what I'm going to make and eat (here's a link to the original post about the site). Fish & Quips, an event sponsored by British ex-pat Sam Breach of Becks & Posh, is a great excuse to flip through my British cookbooks again, and with a recent purchase of some irresistible, albeit expensive, purple asparagus from the Carytown Ukrop's, to try the deceptively simple, loudly flavorful asparagi e torta di Gorgonzola from The River Cafe Cookbook. I'm cheating a little, because Rodgers and Gray really do Italian cooking in their restaurant and cookbooks, but I think it qualifies as British because they've developed a distinctly stripped-down version emphasizing local ingredients that's uniquely their own. Melt the butter very gently in a medium-sized pan, then add the Gorgonzola. Heat until softened but do not allow it to become liquid--it should be just warm, no more. Add the mascarpone, the herbs, a little salt and pepper, and remove them from the heat. This should take only a matter of seconds (the idea is to let the cheeses gently melt together). 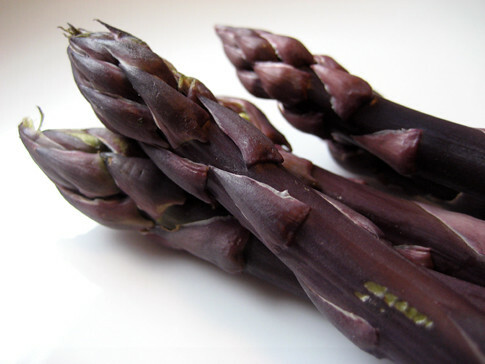 Briefly blanch the asparagus in a generous amount of boiling salted water (roasting is wonderful too). Drain, dry and place on warm plates. Pour over the sauce, and serve with Parmesan. I'm going to try this recipe tomorrow. I just took the family on a history of rock and roll/Jane and Michael Stern inspired trip across Tennessee. We were very happy eaters, but after all those meat and three's and barbeque dinners, I'm craving some more refined food (not to mention crisp veggies!) So, thanks for the inspiration! Hi Brandon - I have that recipe book too ! 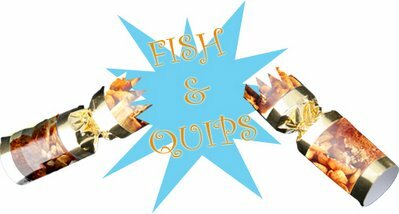 It's a classic - thanks for joining in with Fish & Quips and rooting for the cause.